The Guinness Book records the tallest, largest, most expensively decorated, and oldest Christmas trees in the world. World's largest floating Christmas tree - Rio de Janeiro, Brazil. The Christmas tree has been in use for a long period dating from the ancient times. Traditionally, the tree was set up in homes and decorated within the family. However, with time, Christmas trees have been entered into the world Guinness book of records for a variety of features including cost, lighting, age, and nature of formation. From fir trees, the Christmas tree is now made from a variety of other materials including metal. 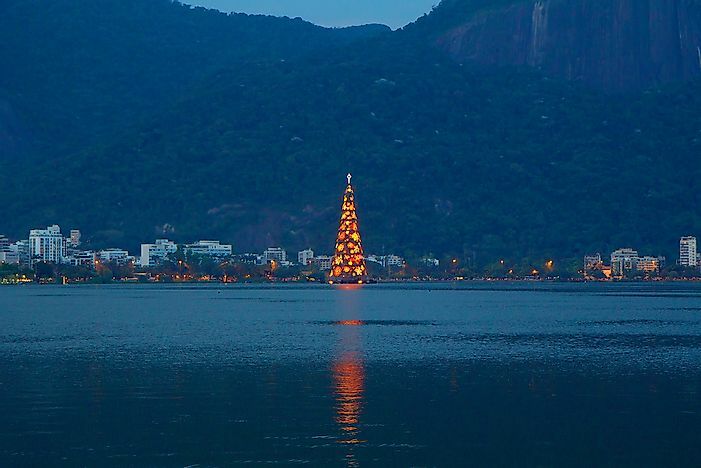 The largest floating Christmas tree is in Brazil’s Rio de Janeiro. The tree was awarded a certificate as the world’s largest floating Christmas tree in 2007 by the world Guinness book of records. The tree has been an important world attraction feature since 1996 when it was first erected. The tree stands at 53m with a weight of 350 tons. The tree is lit every year with about 2.5 million bulbs and fireworks making it the third biggest tourist event in Brazil. The metallic tree rests on 11 floats that form a base to support the tree. The oldest Christmas tree is in Chippenham, Wiltshire, UK. The tree is a 12-inch plant housed in an ornate pot. The tree was purchased from Woolworths in 1886 and is currently in the custody of Janet Parker, a great grandniece of the first owner. The tree has held the world Guinness records for the oldest Christmas tree in the world. Parker decorates the tree with cherubs and the Virgin Mary. The Christmas tree at Cologne Cathedral in Germany was awarded by the Guinness world book of records as the Christmas tree with the most lights in 2006. The tree had 150,000 light bulbs which were lit simultaneously in five minutes. The lighting of the tree was aimed at earning money for a charity organization for orphans. The Christmas tree with the most expensive decor is in Tsunamachi Mitsui club in Japan. The tree was awarded a world Guinness record holder for the most expensive décor on a Christmas tree in 2002. The cost of the décor is estimated to be $16 million dollars. The tree was decorated with 83 pieces of jewelry. The Christmas tree had held the record up to 2010 when an Abu Dhabi Christmas tree worth more than $11million of decorations only was erected. The world largest human tree is located in Guangzhou, Guangdong in China. The tree had a height of 56m with a bottom diameter of 22m and a circumference of 69. The tree made by GZ Thinkbig Communications Co. Ltd and received the Guinness world record for the largest artificial tree in 2015. The tree is mainly green with ornaments and lamps for decoration and a star at the top. The world’s tallest Christmas tree was erected in the Northgate shopping center of Seattle, Washington in 1950. The tree received the world Guinness award for the tallest cut Christmas tree that year. It has a height of 221ft. The tree has more than 3600 lights. While Christmas is a Christian celebration, some Muslim countries have embraced the use of Christmas tree decorations with a unique one being at Abu Dhabi.